Art Walk Easthampton 25 monthly exhibits, curator for five exhibits. Louise Friedl’s paintings seek nuances of color, create atmosphere with subtle tone and brushwork, and combine awareness of nature with expressive color. Color selection for interior paints Practical design integration for homes. Louise Friedl grew up in Iowa near the Mississippi River. Studied photography, drawing and design at Rhode Island School of Design. Traveled extensively in the Western National Parks and White Mountain National Park. Studied drawing at Milwaukee Institute of Art and Design and in Cambridge, MA. Graduate of Maine College of Art, with a BFA in Painting. 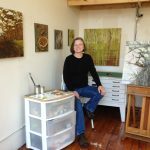 Painting studios in Ithaca, NY and Sonoma County, CA. Travel to San Francisco area each spring to study painting and color. Working at Cottage Street Studios in Easthampton, MA. since 2014. The languages of color and nature fascinate me as a painter. Paintings begin when a moment of color and composition in nature captivates me and a fleeting image echoes with a sense of eternity. Observation shows nuances of color, exaggerated color adds to expressiveness. I am often looking for a poetic statement or philosophic understanding through my paintings.